Knit with a lofty Italian yarn that has a hint of stretch, the Adichie plays with relaxed proportions. 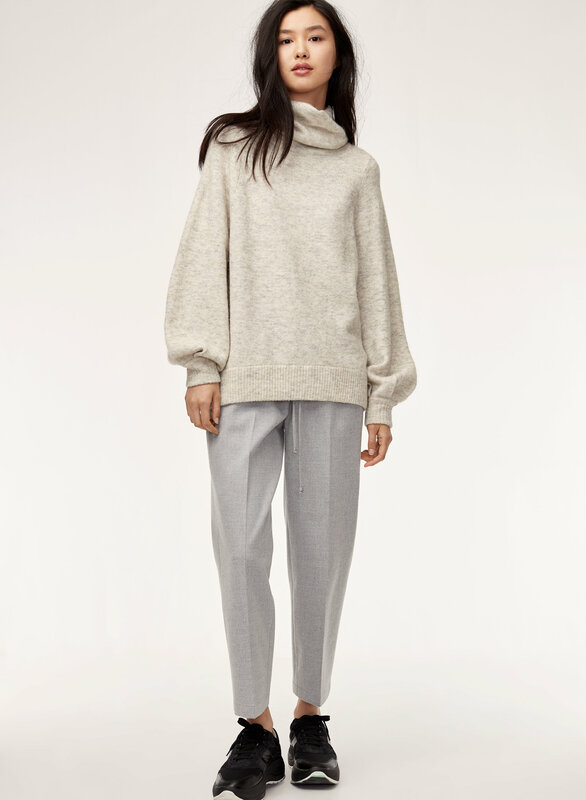 The large funnel neck and roomy shape lend soft, feminine volume. This sweater is super soft and warm. Has the oversized fit but if still flattering. 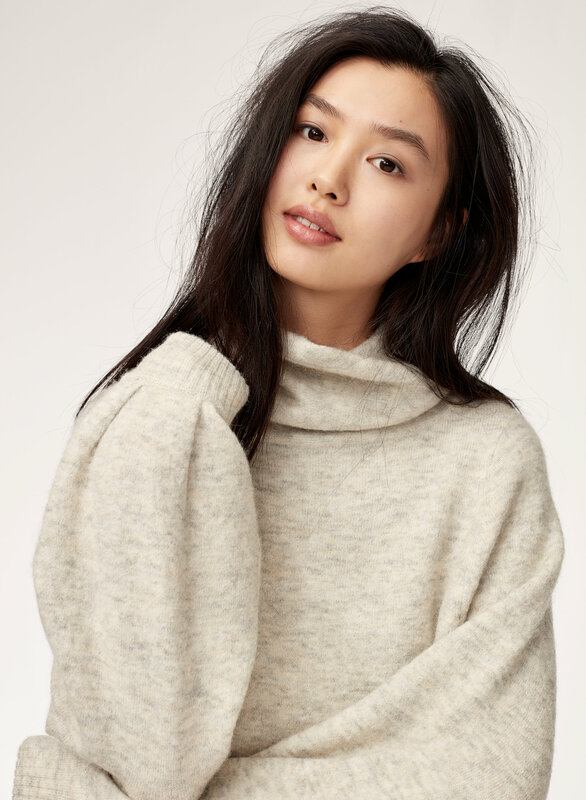 I love how soft the material is and the shape of this sweater. The sweater is really comfy and warm. I thought it might be itchy as I’m really sensitive but I found the material really soft. Cute unique fit, polished yet eye catching! Love this sweater for work, I get a lot of compliments. Fits as you would expect, and hangs perfectly and the sleeves. Great purchase for someone looking for a more lux sweater with a little special touch to wear everyday or for the office. Thick soft fabric. The color (white) and the fit are very flattering. Sleeves are awesome and the turtleneck is perfect. Comfy, Cozy, and fit is perfect! So warm and toasty & beautiful to wear. Perfect on a cold winter day! I have 2 of these sweaters. I bought the heather dark comet colour last year and it's amazing so I bought the vagabond colour as well, but for some reason the vagabond colour makes me itchy and the material doesn't feel as soft. Would definitely recommend trying on different colours and feeling the fabric first since there seems to be some inconsistency. Looks great on! I bought mine in the white and wore it with black jeans. Thick material, a little but itchy but not a big deal. Super comfy and warm as well. This is my new favourite sweater for the winter season. I got a size small but would’ve preferred a size medium as I like turtle necks to be more over sized. During its first couple of wears I found the fabric to be a little bit itchy, but after a few more wears, it feels much softer. I love the look of the sleeves and how it is fitted around the wrists, makes this sweater much more fancy, trendy and unique than the rest of my sweaters. Definitely would get this sweater in another colour! I truly love the style of this sweater! It’s trendy yet classic, something I’ll have for a long time. The material is soft and warm. The only thing I would change is to make it just slightly longer. Otherwise it’s such a great staple piece! Its a soft, slightly oversized sweater! Very cozy! 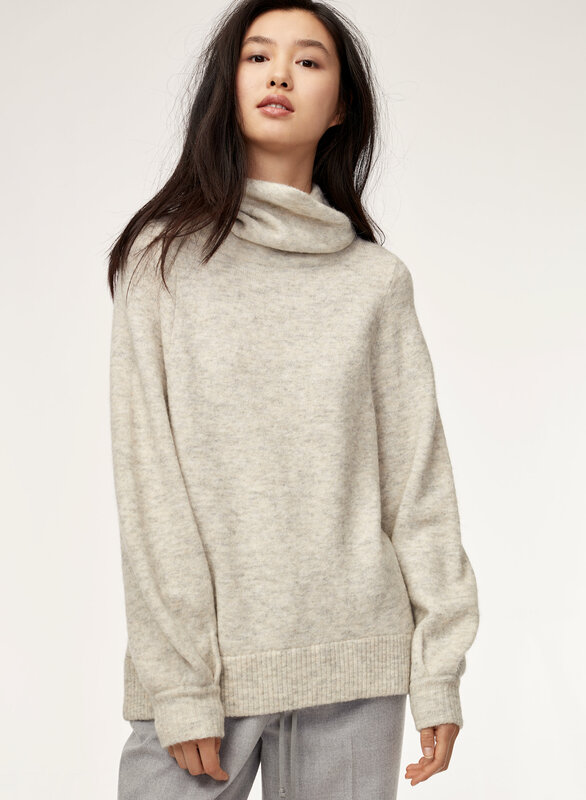 I love the neck and sleeves on this sweater. They give this comfortable, baggy sweater an artistic flare. I wish the waist was a little more fitted and the sleeves were a little longer (I'm tall). I also had trouble with sizing and ended up returning my mediums for smalls. 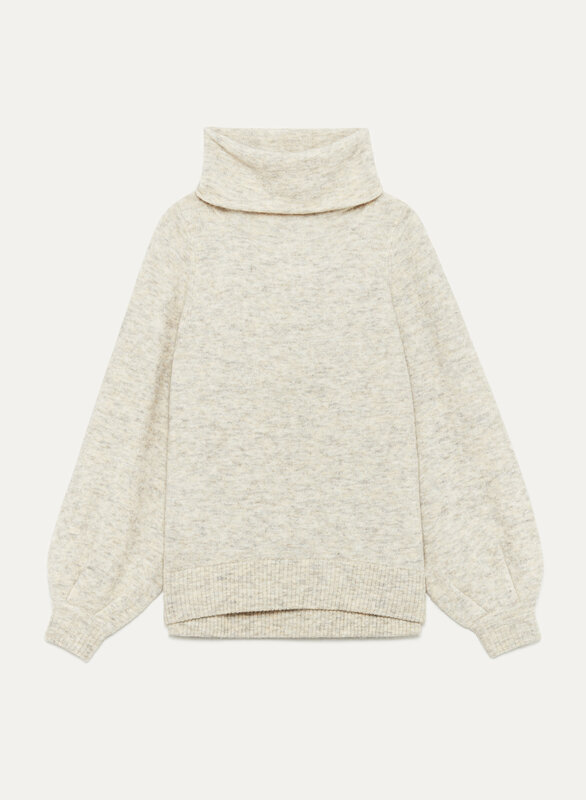 The material is soft and high-quality (especially in comparison to a sweater I bought at Anthropologie that was pricier and started pilling in a week). These sweaters will last a long time, keep me warm, and feel luxurious on my skin. 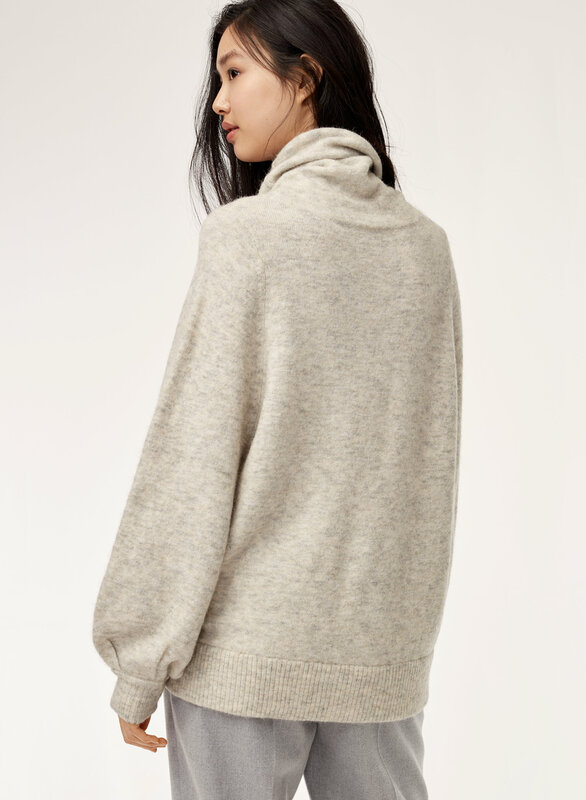 I love everything about the sweater, from the cut, to the fit, to the incredibly soft yarn!! The sweater is great, well worth the money!